Who is the NBA's most improved player of the 2018-2019 season so far? Who is the NBA’s most improved player of the 2018-2019 season so far? Here are five of the most improved players in the league this year. Over the course of the 2018-2019 NBA season, there have been a ton of players who have elevated their game from just one season ago to turn into key pieces for their respective franchises. Some decent players have become good players while some good players are on the way to being great. Here are the players who have seen the biggest improvement from the 2017-18 to the 2018-19 season. Note: We didn’t include sophomore players, as we wanted to examine players who weren’t coming off rookie seasons. 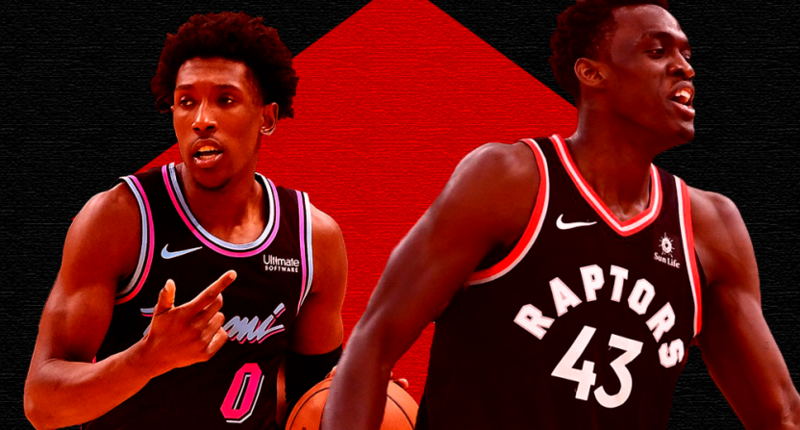 Siakam, drafted 27th overall in 2016 by the Raptors, was one of the best-kept secrets in the NBA last season as a key fixture in Toronto’s dominant bench mob. One season and a promotion to the starting lineup later, Siakam’s emerged as one of the best two-way players in the NBA. The 24-year-old possesses a unique skill set on the court. At 6’9″, he has a 7’3″ wingspan—just ridiculous length for a power forward. Siakam’s a high-motor player, a capable ball-handler, and a silky smooth scorer in the post. His ball-handling is at its best combined with his elite spin-move that’s almost automatic on the fast-break. He can go end-to-end without giving up the ball. Defensively, Siakam is active, capable of switching on smaller and bigger defenders in the post or on the wing, and staying with them. From season to season, Siakam’s seen improvement almost everywhere. He’s more than doubled his points per game (7.3 to 15.0), while increasing his assist numbers (2.0 to 2.9), rebounding (4.5 to 7.0), three-point shooting (22 to 31 percent) and field goal percentage (50 to 57 percent). The Cameroon-native is a mini version of the Bucks Giannis Antetokounmpo. If Siakam could consistently hit threes he’d be an All-Star. At the very least, he’s made sure the rest of the NBA knows his name. In his second season in Chicago, the 23-year-old former Slam Dunk Champion has evolved into a high-end scorer for a team desperate for exactly that. LaVine, a 6’5″ uber-athletic guard who can run the point or generate offense at the two, has taken a noticeable jump during a rebuilding Bulls season. From last year to this year, his scoring rate along with his efficiency has gone up. He’s jumped from 16.7 to a career-best 22.8 points per game. Staying healthy has been key to LaVine’s success, although his game still needs tons of work on the defensive end. For someone so athletically gifted, LaVine’s defensive motor doesn’t match his offensive output at all. The Bulls are a completely joyless team to watch, so the fact LaVine is putting up these kinds of offensive numbers is impressive. I’d love to see what he could do with better teammates and a much better coach. In four seasons in Miami, Richardson’s gone from a second-round pick who earned minutes off the bench to the team’s leading scorer. The 25-year-old has seen a big role increase in 2018-19. With guards Goran Dragic and Dion Waiters missing significant time with injury, Richardson’s been asked to do a lot more on for coach’s Erik Spoelstra’s offense. The 6’6″ shooting guard’s usage has never been higher, as he’s taking the most shots in his career (15.8 per game, his previous high was 10.9). That’s led to significant scoring bump from 12.9 to 17.9 points per game. Richardson’s averaging career-highs and seen increases this year to last in three points made (1.6 to 2.5), assists (2.9 to 3.9) and rebounds (3.5 to 3.9). The Miami Heat aren’t the most exciting team to watch. However, Richardson’s all-around performance makes him one of the NBA’s most underrated players. Despite admitting to being a year older than he previously listed, Hield’s breakout season in Sacramento has been big. The 26-year-old, traded to the Kings in the DeMarcus Cousins Pelicans swap, proved to be a three-point marksman and a solid bench player in his first full season with the Kings in 2017-18. In 2018-19, Hield made the jump into the starting lineup and has been lights out for the surprise playoff contenders. Hield ranks third in the league in three-point makes, behind only superstars James Harden and Stephen Curry. A high-volume shooter, Hield has been ridiculous from three-point range, averaging a career-best 45 percent on 7.4 attempts per game. He’s made so many ridiculous clutch shots for the Kings. Just this weekend, Hield hit this three-point game-winner despite getting triple-teamed. He probably traveled but the degree of difficulty is just insane. Overall, Hield’s scoring nearly seven more points per game (13.5 vs 20.3) while shooting a career-high 48 percent from the field. The Kings have something great brewing between Hield, Fox, and a slew of other talented youngsters. I did not expect Hield or the team to be this good. Nets GM Sean Marks has made some brilliant moves despite a lack of assets during his tenure with the team, but acquiring D’Angelo Russell in the Brook Lopez deal might be the best of them. Still just 22, Russell struggled to stay healthy and consistent during his first season in Brooklyn, appearing in just 48 games. In 2018-19, the Ohio State product has finally taken the step towards stardom many expected when he was drafted second overall by the Lakers back in 2015. In his fourth NBA season, Russell is averaging a career-high in points (19.2) and assists (6.4), three-point percentage (nearly 38 percent) and field goal percentage (nearly 44 percent). He’s played the dual role of facilitator and scorer for the Nets, leading the team’s first unit as a floor general, while slipping over to shooting guard alongside point guard Spencer Dinwiddie on the second unit. Russell’s led the Nets to a shocking 25-23 record, becoming the team’s go-to scorer. After being dealt to Brooklyn, Russell’s value was at an all-time low. Buying low has yielded a huge return for the Nets. Russell is a star.